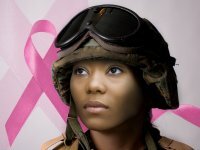 A breast cancer more common in young and black women is the focus of a Department of Defense study being done by Pacific Northwest National Laboratory, Walter Reed Medical Center, and the Windber Research Institute. Advanced proteomics technology at Pacific Northwest National Laboratory will be used to explore a type of breast cancer more common in young and black women. Called triple negative breast cancer, this type of cancer is the focus of a 20-month, $8.6-million research project that aims to find new diagnostic tools and treatment options. The project takes advantage of one of the most comprehensive collections of breast cancer clinical samples in the U.S.—the Clinical Breast Care Project located at the Walter Reed National Military Medical Center in Bethesda, Md., and the Windber Research Institute in Winder, Pa. Led by PNNL proteomics researcher Richard D. Smith, the study is funded by the Department of Defense. See more at the PNNL News Center, and listen to an interview with PNNL cancer biologist Dr. Karin Rodland.